Is there anything better than stone fruit season? 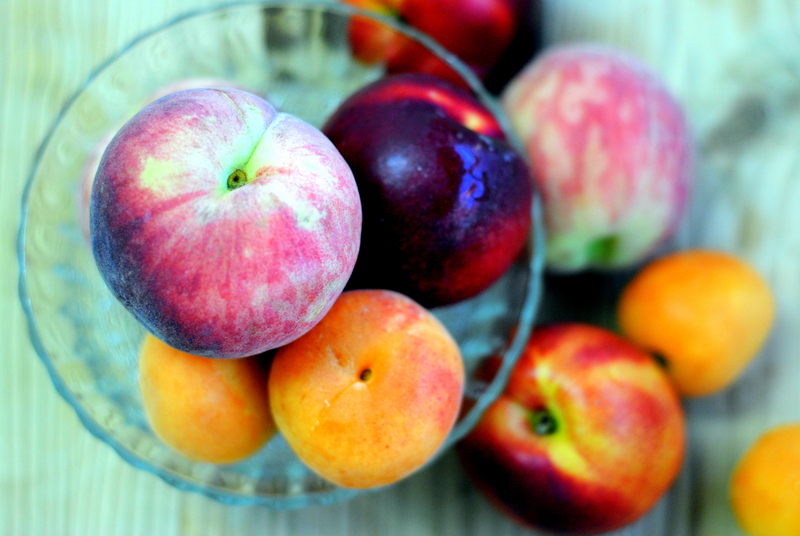 Peaches, nectarines, cherries, plums, apricots – what beautiful abundance! Their appearance signals the start of summer, the onset of warm weather and all the carefree fun that comes with it. Barbecues, beaches, picnics, and pools. Outdoor concerts, muggy nights, ice pops, and laying in the grass. Long, sunny days. A welcome rainfall. No school. Watermelon and fried chicken. Stone fruit. Biting into the ripe, sweet fruit, the juice dripping down your arm, sucking on the pit. Summer. As you may be able to tell, I can get a bit carried away. I buy too much stone fruit, every kind of stone fruit, by the bushel. So that’s what I did. I couldn’t help it. The scent of fresh peaches wafted through the whole market. It was intoxicating. And while I can eat a lot of fruit, I was beginning to worry I couldn’t eat that much fruit. I needed a back-up plan and fast. Luckily Passionate About Baking came to the rescue. Have you been to Deeba’s blog? If not, hurry. Go now. Stop reading this post and go check out her amazing recipes, her sensational photos. You will be inspired, I promise. This particular time I was inspired by her stone fruit tea cake (fitting as the title of her post was “Stone Fruit Tea Cake…Perfect Inspiration for Summer!”). She, in turn, was inspired by Bisous a Toi, another wonderful blog. Isn’t the wide world of blogging fun? Anyway, it’s a beautiful recipe, a lovely tea cake. Light and moist and flavorful, it highlights the fresh fruit, lets it shine. And so easy to make! I made a few changes to PAB’s recipe, the most significant of which was that I baked it in a loaf pan instead of a tart pan. It made for the most delightful breakfast and, as its name suggests, was the perfect accompaniment for a cup of tea. Preheat the oven to 350F. Cream the butter and sugar until light. Add the eggs and vanilla and beat to combine. In a separate bowl, mix together the flour, baking powder, and salt. Add to the dough in three parts (the dough will be quite soft). Fold in the fruit. Using a spatula, transfer the dough to a buttered loaf pan. Bake for 45 minutes to 1 hour, or until a toothpick comes out clean. Aw thanks Betty. Yum, that would be amazing! Beautiful tea cake. I too am a fan of stone fruits (especially white peaches and cherries)! Thanks for mentioning Deeba… going to check out her site right now!!!!! Oooh, yes white peaches! You will love Deeba’s site, I promise! I actually enjoy tea time (snack time) with kids and wish to have this kind of tea cake for my tea… Your cake looks beautiful and delicious! Thanks Nami! I think the kids will really enjoy it, and it gets a lot of natural sweetness from the fruit. Hope you enjoy! What a great way to enjoy summery fruits! I’m with you, I love stone fruits, but sometimes it can get a little repetitive to simply eat them on their own. This cake looks like such a perfect treat this time of year. Thank you Kocinera! I totally agree! And what’s great about this recipe is you can add whatever stone fruit you have around. When I saw this recipe just had to try it…I made my cakes in the cupcake pan and they turned out beautiful. One thing I would like to mention is to make sure all fruit is really ripe. I must have had a nectarine or peach that was not ripe and you can taste it in the cake. This is a delicious recipe that I’ll be using again and will be passing it on to family members and friends. My peach trees are ready and I am overrun with peaches! I now have a fabulous recipe to use those peaches on!!! Thanks Katherine! Hi! I clicked on a link that showed a green and white Napoleon type pastry but got this recipe for Stone Fruit. Do you have the link for the green and white pastry? How odd – I’m afraid I don’t have anything that fits that description! Sorry about that. http://joelens.blogspot.com/2009/05/bacon-brie-artichoke-quiche.html shows a beautiful green cake and has link to your stone fruit tea cake. As lovely as your tea cake is, that was not what I clicked to find sigh. I see also someone else above did as well. I know! I’m really sorry for the mix up and wish I could tell you where to find that green cake. I’ve tried to get removed from it before and will try to straighten it out again (It has nothing to do with that blog but rather the ad/link exchange that brought you to me). Anyway, I’m very sorry to disappoint. I clicked on about 5 links as the others said – a green cake, an egg in weird shapes, etc…. I keep getting your recipes. They sound great – but not what I’m clicking on. You should check it out and correct.